WASHINGTON, D.C. — Today, Tax March announced its new “Tax the Rich” project, an effort to educate the American people and policymakers about taxing the rich and advocate for raising taxes on the country’s wealthiest individuals and most profitable corporations. The seven-figure campaign, led by Tax March and coordinated in partnership with more than a dozen progressive organizations, seeks to build upon the current momentum around taxation in a way that empowers voters, elected leaders, and activists to advocate for taxing the rich. The new project will focus heavily on organizing in states critical to both the 2020 presidential nomination process and the 2020 general election, including the launch of a robust Iowa state program headed by ICAN’s Sue Dinsdale and commitments in Arizona, Colorado, Maine, Nevada, New Hampshire, South Carolina, Wisconsin, and other states. 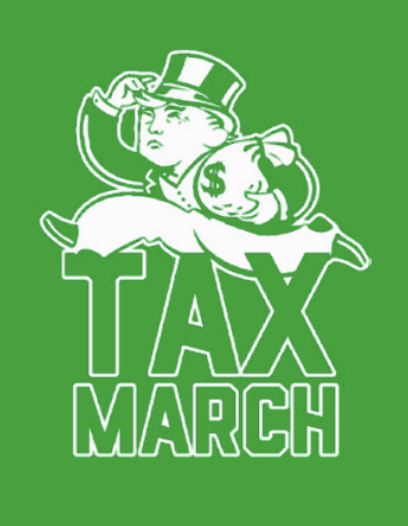 In addition to aggressive on-the-ground organizing, Tax March will spend more than $1 million on television, radio, digital, and print ads to educate the public about taxing the rich. At the start of the new project, Tax March is also releasing new polling about taxing the wealthy, which found that 75 percent of Americans—including 70 percent of Independents and even 60 percent of Republicans—support taxing the rich. The project is launching with the support of the country’s largest grassroots organizations and progressive groups, including: American Federation of Teachers; Americans for Tax Fairness; Center for American Progress Action Fund; Health Care Voter; Iowa Citizen Action Network (ICAN); Indivisible Project; Moms Rising; Public Citizen; United for Respect; and numerous other national and state-based groups. If you’d like to request an interview with a Tax March spokesperson or member of our advisory board to talk about the launch of the campaign, please email Ryan Thomas at [email protected].